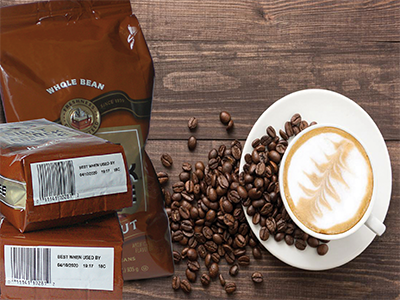 Flexible packaging requires high speed for imprinting date, price, lot and bar codes directly on flexible packaging. High speed thermal transfer overprinters (TTO) use near-edge thermal transfer ribbons that feature a release layer which allows the ink to quickly release from the ribbon after melting. This ensures crisp, dark imprints even at printing speeds up to 40 IPS. Other coding technologies used for flexible packaging include continuous inkjet printing (CIJ) and analog pad printers. All these coding technologies can be found in food packaging, healthcare and retail product manufacturing plants. NETFlex+ Highly compatible wax/resin ribbon with broad substrate latitude at various darkness and energy settings. Delivers fast performance for print speeds up to 40 IPS. Also available in 1100m & 1200m as NETFlex+ XL for longer length efficiencies. NET330 Premium resin ribbon offers strong heat resistance up to 500°F and excellent resistance to water and oils associated with form, fill and seal equipment. Continuous Inkjet Ink (CIJ) CIJ and DOD Inkjet inks are ideal for high speed in-line coding directly on product packaging and outer cases. IIMAK offers a complete product line of inkjet fluids to support virtually all printer technologies available today, such as Videojet®, Domino®, Markem-Imaje®, LINX® and more. Speciality Ink AeroBrand offers over 10 specialty solvent inks for packaging applications, IIMAK Inks offers 12 unique inks for coding onto packages using platen printers, reciprocating coders, roller coders, flexo coders and standard stamp pads. These inks are compatible with a variety of common flexible packaging films, foil, cellophane, wax paper, styrofoam and styrene. Highly compatible wax/resin ribbon with broad substrate latitude at various darkness and energy settings. Delivers fast performance for print speeds up to 40 IPS. Also available in 1100m & 1200m as NETFlex+ XL for longer length efficiencies. Premium resin ribbon offers strong heat resistance up to 500°F and excellent resistance to water and oils associated with form, fill and seal equipment. CIJ and DOD Inkjet inks are ideal for high speed in-line coding directly on product packaging and outer cases. IIMAK offers a complete product line of inkjet fluids to support virtually all printer technologies available today, such as Videojet®, Domino®, Markem-Imaje®, LINX® and more. AeroBrand offers over 10 specialty solvent inks for packaging applications, IIMAK Inks offers 12 unique inks for coding onto packages using platen printers, reciprocating coders, roller coders, flexo coders and standard stamp pads. These inks are compatible with a variety of common flexible packaging films, foil, cellophane, wax paper, styrofoam and styrene.